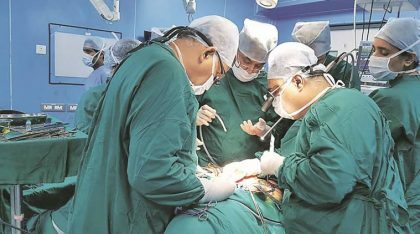 Pune: A team of doctors today successfully performed India’s first uterus transplant surgery, in which uterus of a woman was transplanted in her 21-year-old daughter. A team of 12 doctors, headed by Dr Shailesh Puntambekar, performed the surgery which started at 12 noon today and ended at 9.15 pm at Galaxy Care Laparoscopy Institute here. The younger woman was born without uterus, Dr Puntambekar said. “The patient wanted to have her own baby and was not ready for adoption or surrogacy. Since they knew about the uterus transplant, they approached us and accepted the surgery option,” he said. Fortunately, her mother was found to be a medically suitable uterus donor for her. Show the total recorded video of the procedure.